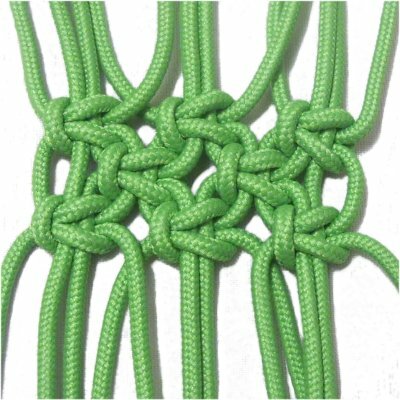 Description: Alternating Square Knots (ASK) create a net-like pattern seen in many Macrame projects, so it's considered the most important of all the basic knots. 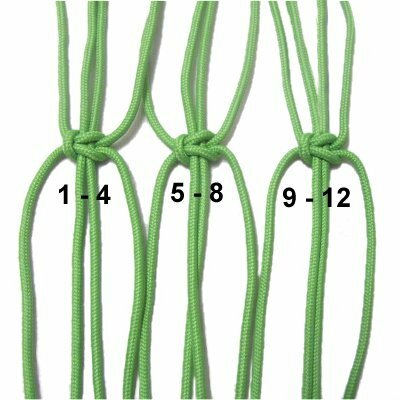 Practice this knotting technique several times if you are a beginner. 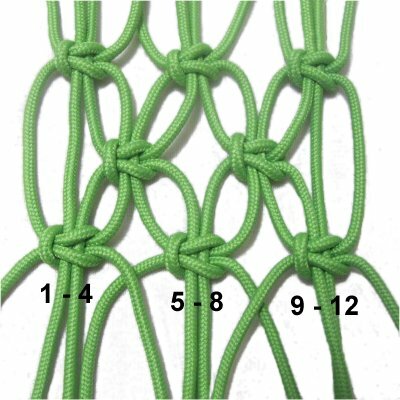 The basic concept is that you tie the Square knots in horizontal rows. Every other row you alternate the cords used to tie the knots. You select two cords from two different knots to make the ASK shift position, creating the interconnected woven design. 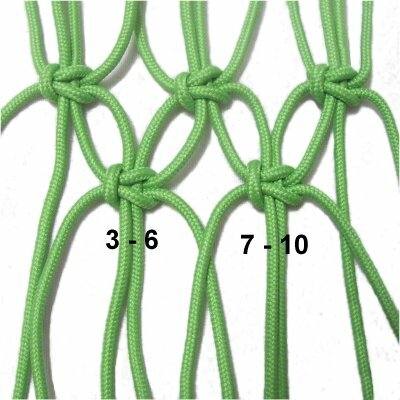 Be sure you know how to tie a Square Knot before you get started. The Striped Clutch is a great project for beginners. 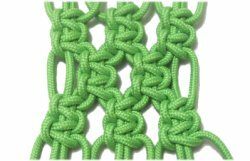 Most of the design is made with Alternating Square Knots. Click on the link or image if you want to give it a try. Make sure you know how to tie SK in both directions. To practice, you need at least six 36-inch cords. Fold them in half, so you end up with 12 (or more) cords to work with. Secure them to your project board, at the fold. Mentally number the cords, moving left to right. Each Square Knot is tied with four cords. Important: The ASK shown below are made with only 12 cords. In a Macrame project you will likely have many more cords to work with. You create each row moving all the way across from left to right. The pattern will tell you what cords to use and how many rows to tie. Always mentally number and count the cords, so you combine the right ones. Step 1: Tie the first row of Square knots with groups of four cords, so there are two working cords and two fillers. 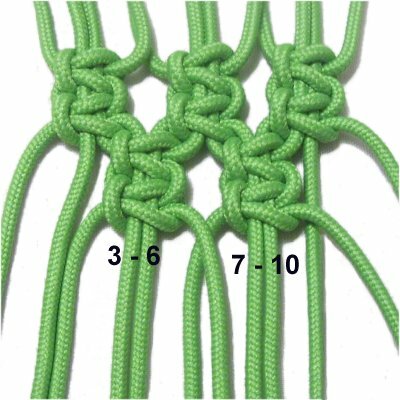 Step 2: Row 2 is made by combining cords 3 - 4 from the first knot in row 1, with cords 5 - 6 from the second knot. The next SK for this row is tied with cords 7 - 10. Most of the time, you will tighten the Alternating Square Knots so they rest close together, like in this image. In some patterns, you may be asked to leave space between the knots, as in the other images shown. Make sure the spacing between the rows is the same, unless the pattern tells you otherwise. Step 4: Repeat steps 2 and 3 at least one more time. 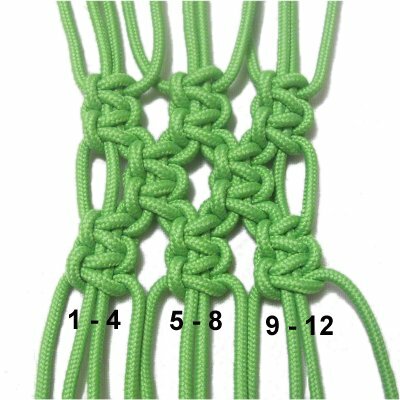 I've seen quite a few vintage Macrame projects that require you to tie rows of Double ASK, so here are the instructions. This type of pattern looks better if the rows of ASK are close together. Step 2: Alternate the cords by tying the ASK in row 2 with cords 3 - 6 and 7 - 10. 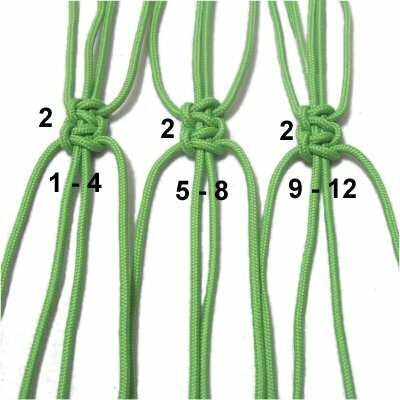 When you tighten the first knot in each set, make sure it rests close to the ASK in the previous row. Step 3: Repeat step 1, to make a third row of ASK. 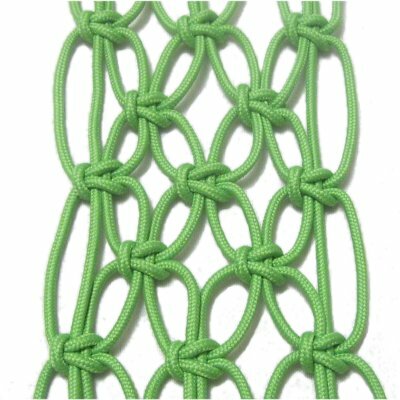 Have comments about Alternating Square Knots? Contact Me.